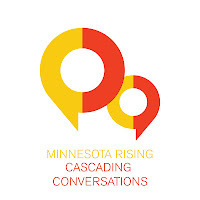 Minnesota Rising: Join the 2014 "Our Minnesota" Cascading Conversations Tour Advance Team! Join the 2014 "Our Minnesota" Cascading Conversations Tour Advance Team! We're excited announce that Alexis Walstad and Taylor Vollmer will serve as 2014 Advance Team Co-Coordinators for the "Our Minnesota" Cascading Conversations Tour! Do you want to join the team? We're looking for curious minds and deep listeners to help engage and capture key insights about what emerging leaders care about and envision for the future of Minnesota. Whether interviewer or interviewee, we'd love to have you as part of the conversation this summer! We – Alexis Walstad and Taylor Vollmer – extend to you an invitation to serve as a member of the 2014 Advance Team as we embark on our second tour. An advance team prepares people and places for powerful events and meaningful connections; our hope is that you’ll consider joining us. The “Our Minnesota” Cascading Conversations Tour is a process designed to engage emerging leaders in Minnesota in meaningful conversations with each other with the purpose of building trust, fostering relationships, and discovering a shared vision for Minnesota's future. The conversations will cascade from many different starting points. As a member of the Advance Team, your role would involve activating some of those starting points by initiating at least three conversations and then sharing the highlights of those conversations by mid-August (which will conclude the first leg of this tour). We have prepared strategies on how to go about starting those conversations – but that will come later. Before you decide to climb aboard, we realize you would probably like to familiarize yourself with the work we do at Minnesota Rising and the purpose of our tour. To accommodate this, we welcome you to visit our blog and the Cascading Conversations Tour webpage. Assuming your interest, we would like to invite you to our Orientation, which will take place in the Twin Cities on a weeknight during the week of May 18th . Orientation will be a chance for you to participate in your first conversation. Since our organization values the impact of collaboration, part of your welcome will include party food and various yard games – bring your competitive pants! If you agree to join us, we will plan to check in with you semi-regularly (1-2 times over the months of your commitment), and we'll also be available to connect at any time if you have questions. Both of us have hosted numerous conversations thus far, and we have found the process highly energizing, both for ourselves and those we've invited to participate. We believe you’d similarly benefit from our initiatives. Please let us know by Thursday, May 1 if you're willing to serve as a member of the Advance Team for the “Our Minnesota” Cascading Conversations Tour. We will then follow up with you about Orientation and next steps. We are excited for you to take part in our vision to connect emerging leaders across the state through Minnesota Rising! Please feel free to contact us with any questions or for more detail at minnesotarising[at]gmail[dot]com.